Big data promises to make better predictive algorithms that in turn can make better products available to the unbanked and underbanked. Affordable access to credit is of vital importance to the economic well-being of these consumers. But does big data live up to its big promises? 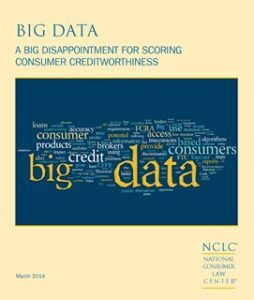 NCLC’s analysis concludes that as data about consumers proliferates, so does bad data. And, big data scores may violate federal consumer protection and racial discrimination laws. Published: 3/6/2014, ©National Consumer Law Center, Inc. This report builds on NCLC’s advocacy, training, publications, and public policy work on consumer privacy issues. to promote family financial well-being. Learn more about NCLC’s work in this area. About 64 million people in the United States have no credit history or lack sufficient credit history to generate a credit score, cutting off access to traditional banking services. Big data brokers promise to use information culled from Internet searches, social media, and mobile apps to help lenders make decisions as to creditworthiness of individuals. The resulting data and lending products may provide affordable access to credit for these individuals or they may be a means of preying on vulnerable communities. 1. Are the decisions based upon accurate data? 2. Can the algorithms, when fed with good data, actually predict the creditworthiness of low-income consumers? 3. Does the use of big data in reports used for credit, employment, insurance, and other purposes comply with consumer protection laws? 4. Is there the potential for a discriminatory impact on racial, geographic, or other minority groups? 5. Does the use of big data actually improve the choices for consumers? Expanding the number of data points also introduces the risk that inaccuracies will play a greater role in determining creditworthiness. Given these indications of accuracy problems, we conducted our own survey for this report of the data maintained on consumers by big data brokers. Even given our initial skepticism, we were astonished by the scope of inaccuracies among the data brokers we investigated. In general, obtaining the data was challenging and the reports our volunteers received were riddled with inaccuracies. Errors ranged from the mundane—a wrong e-mail address or incorrect phone number—to seriously flawed. NCLC also analyzed 7 loan products based on big data underwriting: MySalaryLine, Plain Green, Great Plains Lending, Presta, and RISE (issued by ThinkFinance), Spotloan (issued by ZestFinance) and LendUp. Of these, 6 companies market themselves as alternatives to payday loans. However, the loan terms for the 7 products failed the test, showing that they are not safe or alternatives to payday loans. All 7 products feature triple-digit annual percentage rates and most do not offer at least 90 days for the repayment of loans or 30 days per $100 borrowed (characteristics of payday loans). Electronic Funds Transfer Act (EFTA) All of the lenders require the borrower to provide access to a bank account or paycheck. The requirement for electronic access may violate the EFTA. Equal Credit Opportunity Act (ECOA) The ECOA prohibits racial discrimination in the granting of credit. It prohibits not just disparate treatment but also policies or practices that have a disparate impact. Big data broker marketing materials judge consumers based upon data generated from their Internet usage, mobile applications and social media. Access and usage of these sources vary by race and socioeconomic status so any algorithm based upon them may have racial disparities. Fair Credit Reporting Act (FCRA) Many of the big data brokers could be considered consumer reporting agencies and thus subject to the FCRA. Three of the most important functions of the FCRA deal with accuracy, disclosure, and the right to dispute items on a credit report. Given the size of the data set and the sources of information, it is highly unlikely that the companies that provide the big data analytics and the users of that data meet these requirements. The Federal Trade Commission (FTC) should continue to study big data brokers and credit scores testing for potential discriminatory impact, compliance with disclosure requirements, accuracy, and the predictiveness of the algorithms. The FTC and the Consumer Financial Protection Bureau (CFPB) should examine big data brokers for legal compliance with FCRA and Equal Credit Opportunity Act (ECOA). The CFPB should create a mandatory registry for consumer reporting agencies so that consumers can know who has their data. Define reasonable procedures for disputing the accuracy of information. The CFPB should require all of the financial products it regulates to meet ECOA’s Regulation B requirements for credit scoring models.